A freestanding concrete staircase spirals between the floors of this timber-frame and stone building remodelled by the founders of A1 Architects to form their own home and studio in Prague (+ slideshow). 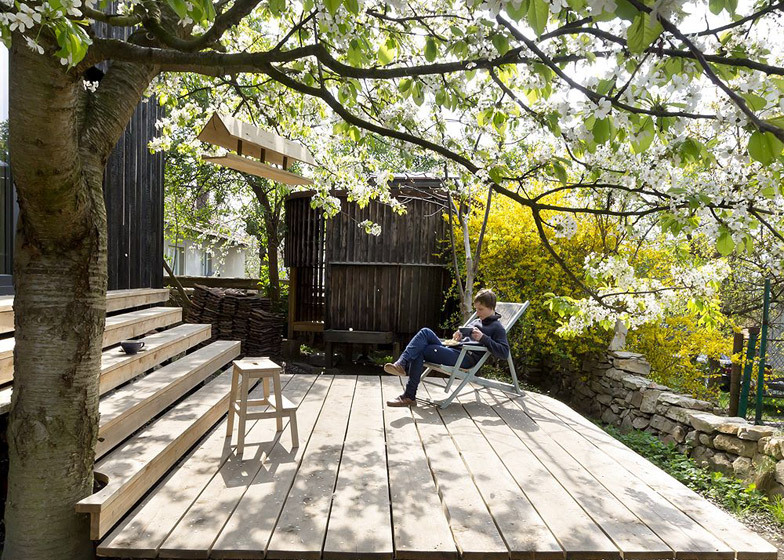 A1 Architects created the live-in studio within a two-hundred-year-old workers' cottage in the east of Prague. Lenka Kremenova, co-founder of the studio, designed the renovation six years ago, while studying at the Academy of Arts, Architecture and Design in the city. 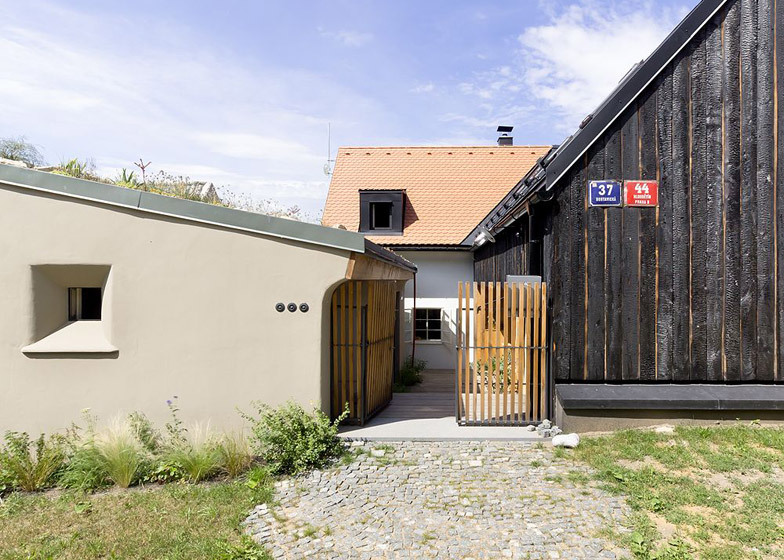 The Czech studio intersected a new wooden building with the old stone structure to create a cross-shaped plan with enough space for both a 60-square-metre studio and a 160-square-metre home for Kremenova and partner David Maštálka. 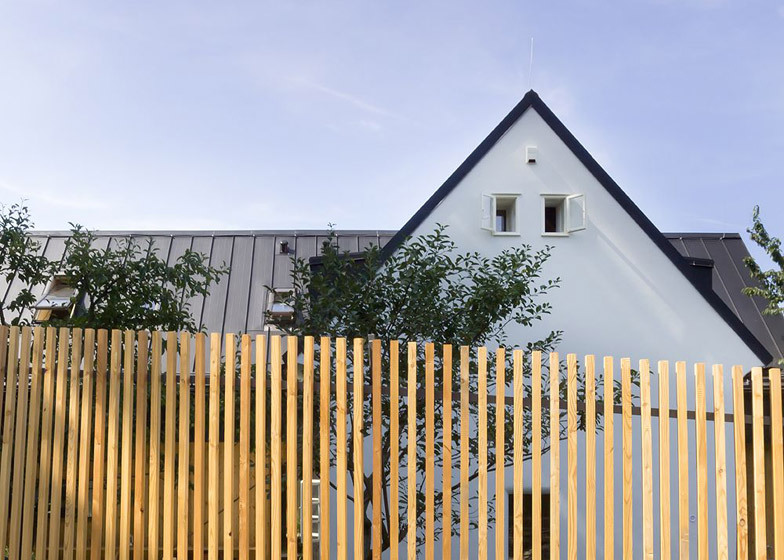 "The main idea of how to connect old and new parts comes from respecting the typical central axis of the old house, so the cross layout of two intersecting houses became the most convincing [solution]," Kremenova told Dezeen. 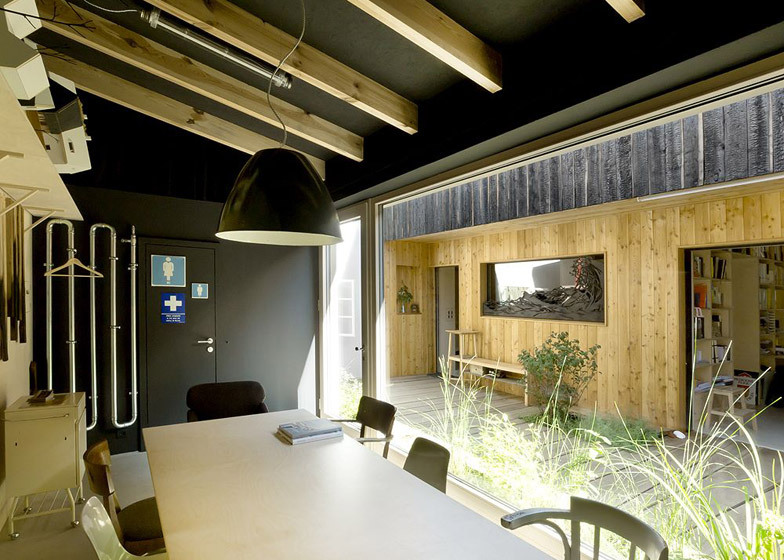 A hallway between the old and new structures separates the work space from living areas, with the home mainly in the stone house, and the architecture studio in the new wooden building. 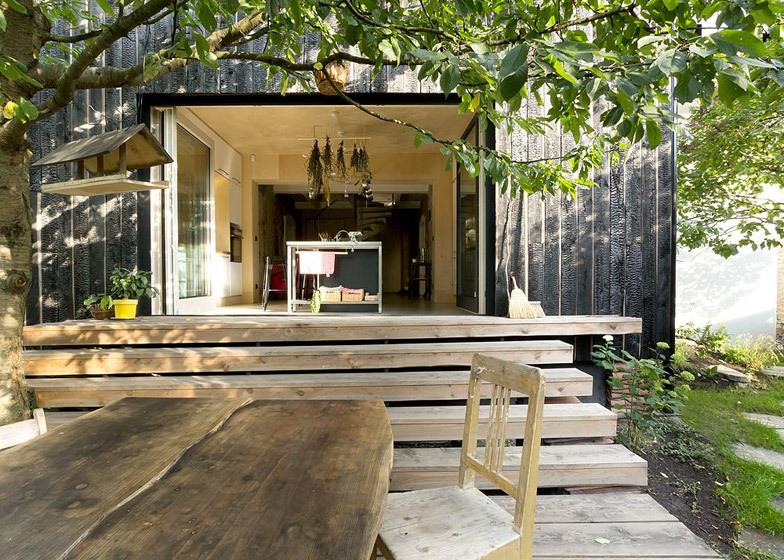 Where the two buildings intersect, the original stone walls of the house have been left exposed and the joints with the new timber-clad interior are visible. 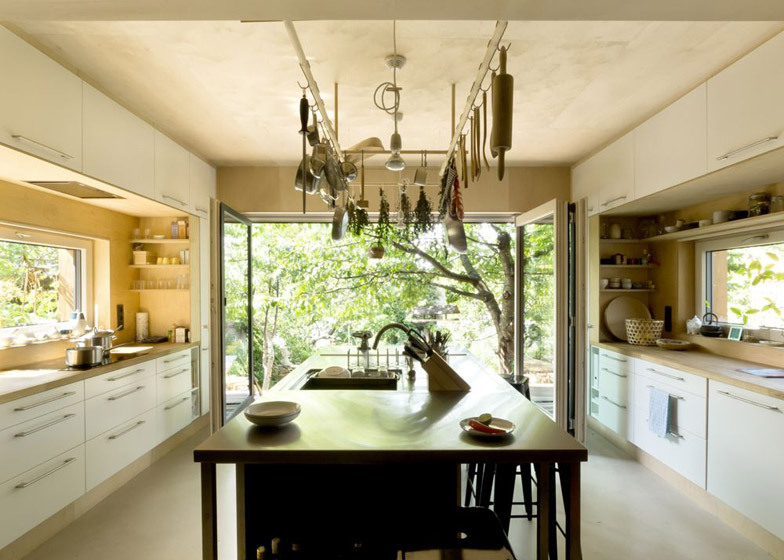 An open-plan kitchen occupies this intermediary space, with glazed sliding doors leading to a garden. To the rear of the kitchen, a spiralling concrete staircase with a slim metal handrail is positioned in the centre of the hallway. 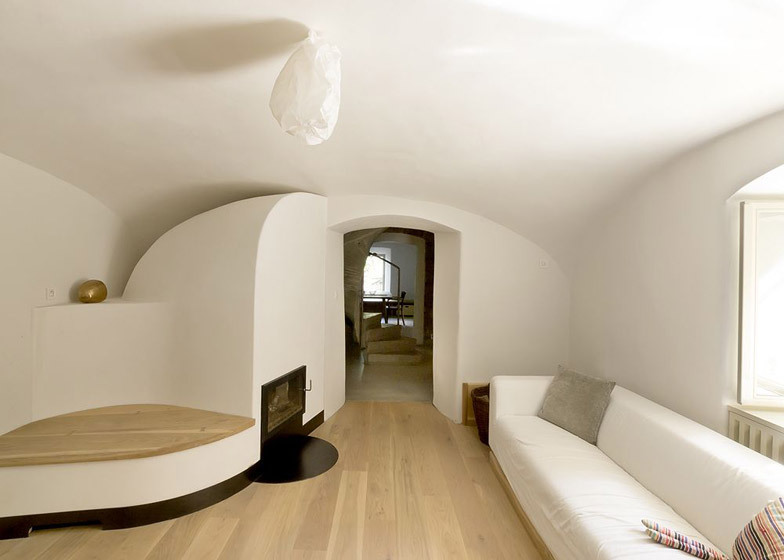 The stairs rise through a wooden ceiling to a three-bedroom loft and bathroom. "The staircase is the junction point of the house. 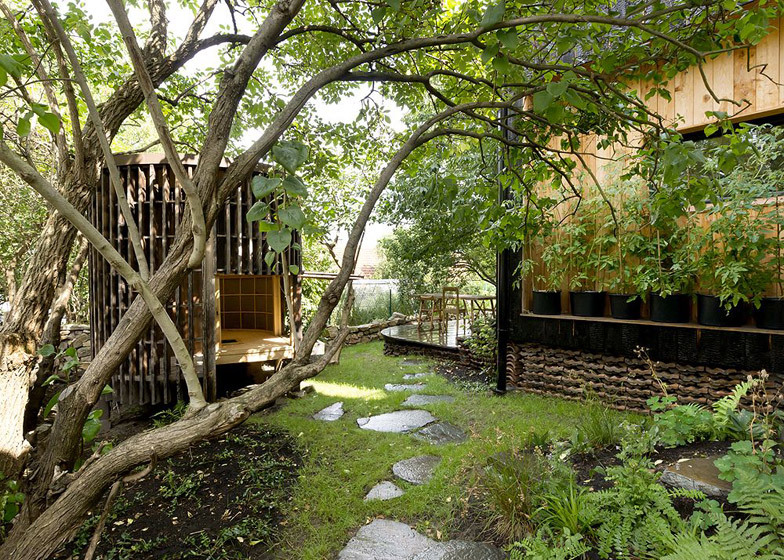 It is just in the centre of the cross intersection of both houses and connects them also vertically," said Kremenova, whose studio also completed a Japanese-inspired tea house in Prague this year. "We decided to keep it without any treatment, only the steps and some sharp edges were cut and polished. We enjoyed the pure craftsmanship of the builders," she added. 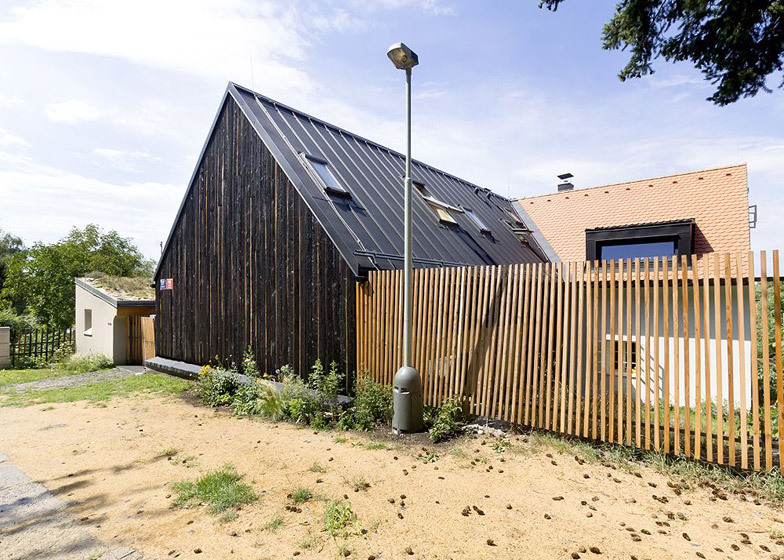 The new section of the building is constructed from timber, with a metal-gabled roof and a black-charred facade that contrasts the white plastered stone walls of the original building. "When thinking of a new addition to an old house we always prefer to make a statement and emphasise the situation and the true character of both, so I used the contrast and dialogue between old and new in our house quite naturally," said the architect. The interior of the stone building has low vaulted ceilings that have been painted white throughout to maximise the light from just six small windows that have been channelled through the thick plaster-coated stone walls of the cottage. "The old house has a particular heavy feeling and we knew from the very beginning we want to respect it and follow the atmosphere," said the architects. In contrast, the interior of the new structure is clad in pale timber with large glass sliding doors that provide access to a patio on the south side of the building. The clear separation of the domestic and work activities means clients and employees do not need to enter the private living space. "You have to learn to divide your privacy and work," said Kremenova. "It might seem difficult, but as architecture is not just an 8 hours-a-day job, we found out that it is much more comfortable for us, because we actually spend more time at home than ever before while having a studio in the center." "You can easily skip off to the garden or take a short nap. We do enjoy it but we know that it could not be ideal for everyone... You must really like your work and have nice colleagues." A1 Architects also explored the potential of compact living spaces in an exhibition called The Small House at their former school, the Academy of Arts, Architecture and Design in Prague, in 2009.